What Does Code P0481 Mean? OBD II fault code P0481 is a generic code that is defined as “Engine coolant blower motor 2 -circuit malfunction”, or sometimes as “Fan 2 Control Circuit”, and is set when the PCM (Powertrain Control Module) detects an electrical failure, defect, or malfunction in the control circuit of the #2 radiator cooling fan. Note that this code applies only to applications that are fitted with more than one electrically operated radiator cooling fans. Note also that depending on both the nature of the failure and the application, this code may be accompanied by several other codes, which could include codes P0480, and/or P0482. Radiators are actually heat exchangers in the sense that the heat energy in the engine coolant is radiated away to the atmosphere when the hot coolant passes through the collection of small-diameter tubes that collectively make up the radiator core. However, to be effective heat exchangers, radiators depend on a strong airflow through the core to absorb the coolant’s heat. While driving at high speeds often creates a strong enough airflow through a radiators’ core to manage the engine temperature effectively, this airflow reduces significantly at low road speeds, and stops altogether when the vehicle is stationary, or moves very slowly in heavy traffic. Thus, to create a sufficiently strong airflow to manage the engine temperature regardless of driving conditions or vehicle speed, many applications use one or more electrically operated fans to draw air through the radiator core. However, on many applications, the fans may be of different diameters, or one or both fans are controlled in such a manner that one fan (or sometimes both) can run at different speeds for varying lengths of time, depending on the ambient temperature, engine temperature, and vehicle speed. The primary purpose of this is to minimize the load on the vehicles’ electrical system, while providing enough airflow through the radiator to manage the engine temperature effectively. For instance, if the vehicle is moving slowly in heavy traffic in low ambient temperatures, the PCM may activate only one fan to run at a percentage of its maximum speed. Based on input data from the engine coolant and vehicle speed sensors (among others), the PCM may increase or decrease the operating fan’s sped to maintain the engine’s temperature as driving conditions change, or it may activate the other fan as well when a single fan cannot control the engines’ temperature. As a practical matter, the radiator fans play a critically important role in engine temperature management strategies, and as such, the PCM monitors the operation of the radiator fans very closely in order to prevent the engine from overheating. Thus, if the PCM detects any defect, failure, or malfunction in any radiator fan’s control and/or signal circuits, it recognizes that it cannot control the engine’s temperature effectively, and will set code P0481 and illuminate a warning light as a result. Where is the P0481 sensor located? The image above shows a typical twin-fan layout attached to a radiator. Note the location of the activating and switch-over relays in this example, but be aware that on many applications, these relays may be located elsewhere, such as in a fuse box under the dashboard, or in the engine compartment. Note also that on many applications, the fans are controlled with resistors instead of relays; in these cases, the PCM switches circuits between resistors, which has the effect of passing more or less current to a given fan to increase or decrease a fan’s speed, depending on which resistor is switched in at any given moment. WARNING: Regardless of the radiator fan control mechanism in use on an affected application, non-professional mechanics are strongly urged to familiarize themselves with the control system before attempting a diagnosis of this code. Failure to do this will almost certainly result in a misdiagnosis, and quite possibly, additional damage to the vehicles’ electrical system, which could result in catastrophic engine failure due to overheating. If you have any doubts about your ability to diagnose and repair this code, the better option would be to refer the vehicle to the dealer or other competent repair facility for professional diagnosis and repair. What are the common causes of code P0481 ? 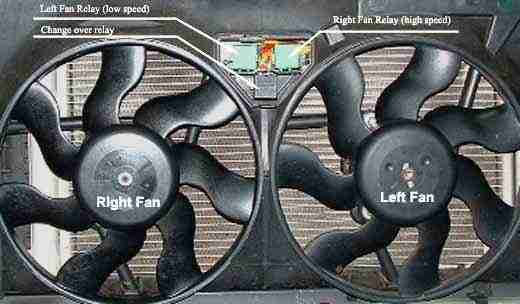 Some common symptoms of code P0481 could include the following, but note that some of the possible causes listed here will be indicated by codes that may not appear to be related to radiator fan control issues. Nonetheless, all additional codes must be investigated and resolved in the order in which they were set and stored since P0481 may have set as a result of one or more additional codes, as opposed to having caused the additional codes to be set.